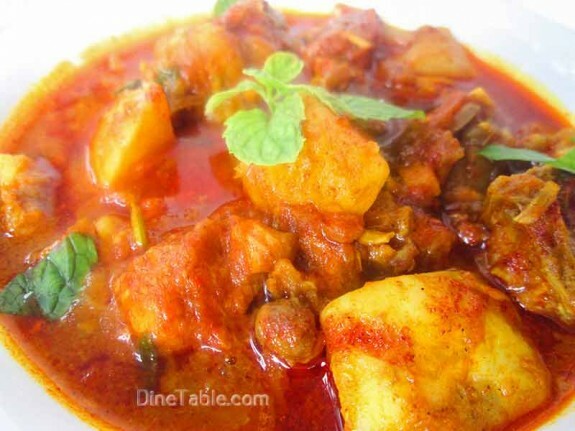 Chicken Potato Curry is a delicious authentic Kerala recipe. It is a quick, simple and tasty dish. 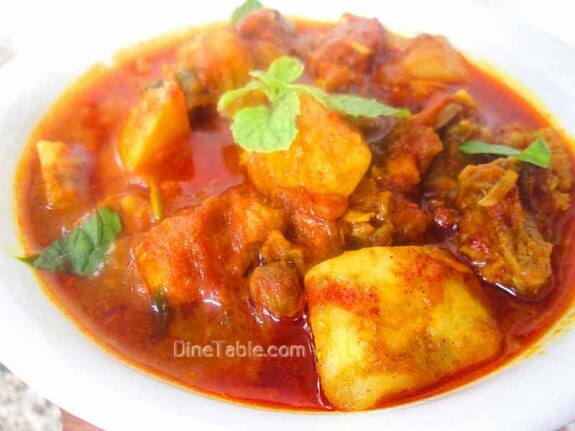 This curry can be served with Pathiri, Battura, Steamed Rice, Ghee Rice etc. 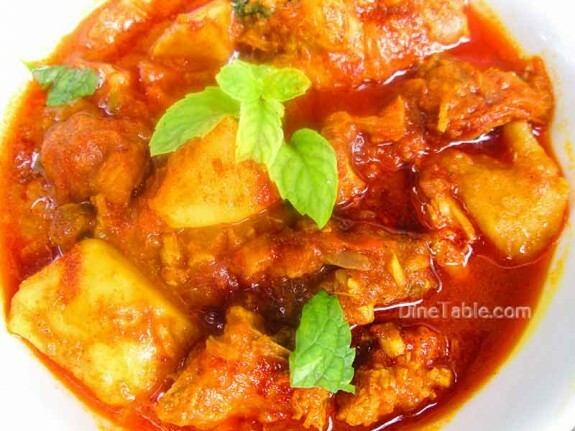 Tryout this yummy curry at your home. Chicken is a great source of lean and low fat protein. It is also rich in phosphorus which helps to maintain strong teeth and bones. Potato is a very good source of vitamin B6, potassium, copper, vitamin C, manganese, phosphorus, niacin and dietary fiber. Clean, wash and cut the chicken into medium size pieces. Marinate the chicken pieces with 1/2 tsp of red chilly powder, 1/4 tsp of turmeric powder, 1/4 tsp of pepper powder and salt. Heat 4 tbsp of oil in a deep pan. Add thinly sliced onion into it and saute until golden. Add ginger garlic paste, green chillies and curry leaves into it. Saute until their raw smell is gone and add chopped tomatoes. Cook for 4 minutes on a low flame. Add 1 tsp of red chilly powder, 1/4 tsp of turmeric powder, 1/4 tsp of pepper powder, coriander powder, salt into it and mix well. Add the marinated chicken pieces, cubed potatoes, garam masala powder, salt and 1 cup of water into it. Mix well and cook for a few minutes. Bring it to boil and then cover and cook on a low flame for about 35 minutes until the chicken pieces are cooked well. Open the lid and add 1/2 cup of thick coconut milk and cook for 3 minutes. Switch off the flame. Heat 1 tsp of oil in a small pan. Add sliced shallots and fry until brown. Add a few curry leaves and stir for a few seconds and pour over the chicken potato curry. Tasty Chicken Potato Curry is ready.